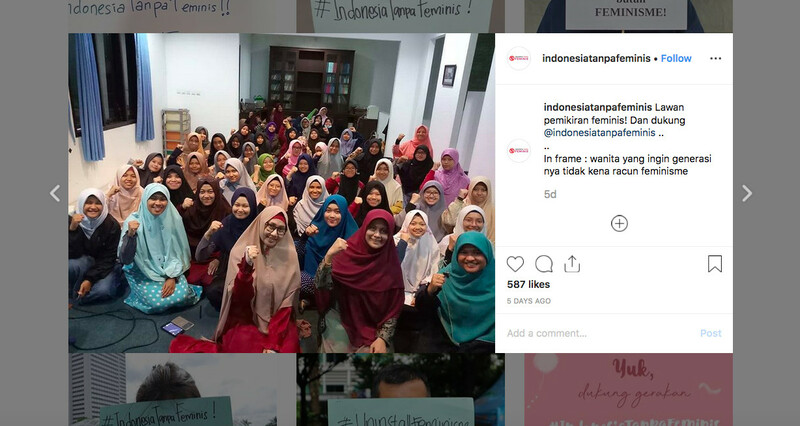 An antifeminist group, Indonesia Tanpa Feminis (Indonesia Without Feminists), has launched a social media campaign amid heated debate over proposed sexual violence legislation that pits feminists and some Islamic groups against each other. Since the first posting on March 17, the account has garnered more than 1,800 followers. However, popular Instagram influencers in Indonesia typically have more than 50,000 followers each. On one of the posts, an unnamed woman holds up a sign saying she doesn’t need feminism because it “demonizes traditional family constructs”. Some of the group’s older posts framed feminism as a blasphemous Western idea that is antithetical to Islamic values. The group asserts that the feminist notion of complete authority over one’s body is wrong, saying that “My body is not mine, but rather Allah’s”. An Instagram user commented on this particular post, saying that even though it is God’s body, women should make sure that other people treat it well. “Don’t we need to ensure that we live in a world where your/God’s body is respected?” the user asked. The online movement has received strong responses from Indonesian millennials who claimed that the group misunderstood feminism. Frisanty Marisa, a 24-year-old private employee in Jakarta, said she felt uncomfortable with the group’s presence on social media. “They hold a wrongheaded view of feminism. They’re content with the injustices done to women,” she said. Rizqika Arrum, a 23-year-old volunteer at a nongovernmental organization in Jakarta, shared that opinion, saying the movement would not have existed without feminism in the first place. “The fact that these self-proclaimed antifeminists are able to congregate and voice their aspirations means they’re enjoying a privilege resulting from decades of progress in feminism,” she told The Jakarta Post. Antifeminist discourse has gained traction in recent months, especially following the controversy surrounding the bill on sexual violence. The bill, which the House of Representatives has deliberated over since 2016, sparked an uproar when it gained momentum at the end of last year when the case of Baiq Nuril – a sexual harassment victim in West Nusa Tenggara who was convicted for defaming her alleged harasser – came to light. Those who oppose the bill consider it to be pro-adultery and in support of lesbian, gay, bisexual and transgender (LGBT) people. An activist and a program director of the Support Group and Resource Center on Sexuality Studies at the University of Indonesia, Nadya Melati, dismissed Indonesia Without Feminists as a fringe movement that had little to no impact on the country’s progress toward female empowerment and gender equality. "A diversity of thoughts is a symptom of a healthy democracy. As long as we focus on bolstering our feminist discourse and refuse to provide them with a platform, I don’t think they’ll become much of a problem,” Nadya told the Post. She likened the group to the Indonesia Tanpa Pacaran (Indonesia Without Dating) movement, which she said also used the façade of Islam to enforce its idea of moral absolutism. “They’re using the pretext of religion as a political weapon. In reality, many Muslim women support feminism,” she said. She said she hoped the government would pass the sexual violence bill soon to protect millions of female employees who have been vulnerable to harassment and abuse. Indonesia has seen several online campaigns starting with the words “Indonesia Without” in past years. Among the first was “Indonesia Without FPI”, a campaign attacking the existence of the archconservative Islam Defenders Front. Later, a counter-campaign emerged called “Indonesia Without JIL”, which referred to the Liberal Islam Network.